You can easily add or delete a page in your documents with Word for Mac. 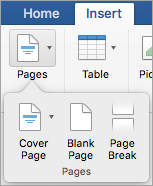 To add a new blank page or page break to your document, click Pages on the Insert tab, and then choose either Blank Page or Page Break. 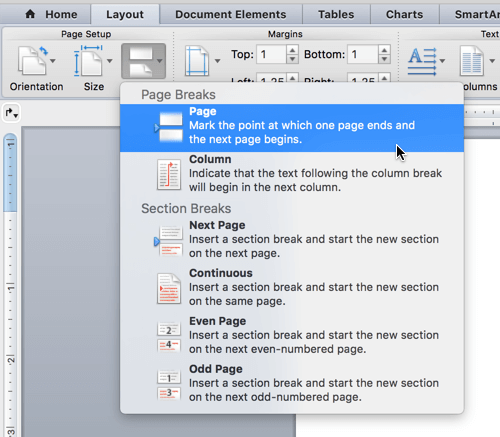 If you choose Page Break, all subsequent content after your insertion point will be moved onto the next page. You can delete a blank page at the end of your document, or empty paragraphs or page breaks, by showing paragraph marks. Press ⌘ + 8 to show paragraph marks. To delete empty paragraphs, select the paragraph mark and delete it. To delete manual page breaks, select the page break and delete it. Note: If you want to delete the entire document, rather than just one or more blank pages within the document, go to Finder, locate your file and drag it to Trash. Your items aren't permanently deleted until you empty the Trash. 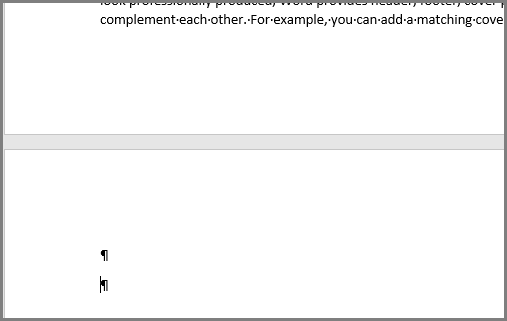 Turn on paragraph marks to see what’s causing the blank page by clicking Show all nonprinting characters on the Standard toolbar. 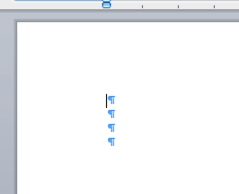 If you have extra, blank, paragraphs at the end of your document you’ll see empty paragraph marks (¶) on the blank page. Select them and then remove them by pressing the Delete key on your keyboard. If the empty page is the result of a manual page break, you can select the page break and press Delete to remove it. This is one of the most common causes of an unwanted blank page in the middle of a document too. 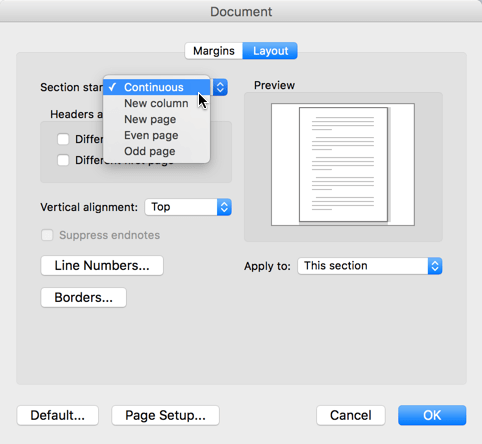 Caution: If a section break is causing a blank page in the middle of a document, removing the section break can cause formatting issues. If you intended for the content that follows that point to have different formatting, then keep the section break. You don’t want to delete that section break because that would cause the pages before the section break to take on the formatting of the pages after the section break. You can, however, change the section break to a Continuous section break, which will preserve the formatting changes without inserting a blank page. Click on the page AFTER the section break you wish to change. Click the Format menu, then Document. On the Document dialog box change the Section start to Continuous. If you still have an unwanted blank page at the end of your document, then it’s likely that the preceding page has a table that goes all the way to the bottom of it. 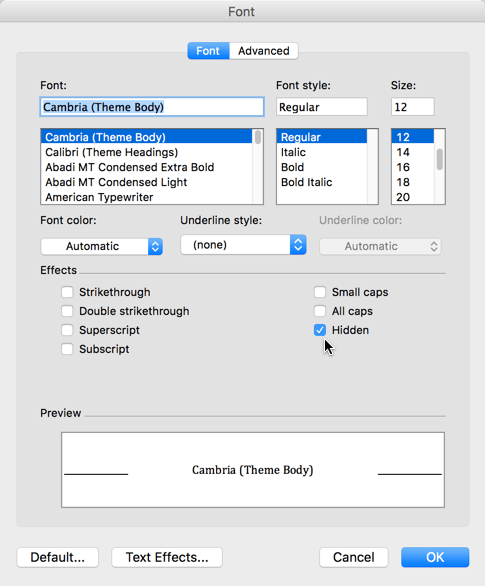 Word requires an empty paragraph after the table and if your table goes all the way to the bottom of the page the empty paragraph will be pushed onto the next page. You won’t be able to delete that empty paragraph mark. The easiest way to resolve this is to simply hide the empty paragraph at the end of the document. Select the paragraph mark on the extra page. Click the Font item on the menu. The unwanted page should disappear. Do you have suggestions about how we can improve Word? If so, please visit Word for Mac UserVoice and let us know!